Most of my friends are now sick with a cold or a flu. It is that time of year. Germs travel fast in the office. But, have you ever wondered what the most germ filled place in the office is? It’s not the toilet. The dirtiest thing is… the Keyboard! The computer keyboard holds more germs than the toilet. This is what the research says, you can see the original news article over at BBC here. I have read about this many times before and I think it is really interesting. The good thing about this news is that the keyboard is easy to clean. A quick spray with disinfectant or something like that can potentially stop you from getting food poisoning or the yearly flu. Or, if you can’t clean the keyboard (because it isn’t yours) then make sure you wash your hands after using one. 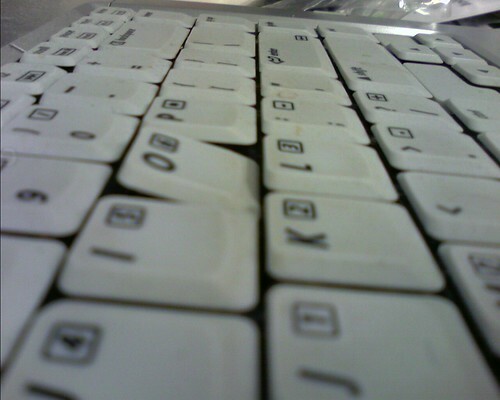 How dirty do you reckon your keyboard is? Why does this not surprise me. If you read the article it says that there is 150 times the safe bacteria amount on your keyboard. Gross. Yeah my keyboard, that im using now, is covered in stains from lunch yesterday. i should wash it… but…. I’m not a big germaphob, but the keyboard thing can be disgusting. I’ve seen some co-workers keyboard with food and some other weird colors stuck in it. I guess that’s why it’s good to have hand sanitizer right at your desk. Karl – there are a few keyboards in my work covered in food stains. It isn’t that appealing! Clay – Might be a good idea I reckon. Thanks for the comment.